Evergreens, Alternative Evergreens, 91s, and 5 milers. When: Most groups meet on Tuesdays at 10.00 except Evergreens who meet at 9.30. 5 milers meet fortnightly, the rest meet weekly. Meeting point: All groups meet at the New Bridge, Ilkley except Evergreens who meet at Riverside Inn car park, Ilkley. Cost: All groups are free, but a car sharing contribution of approx. £3.00 is expected. There are usually 2 coach trips a year for walking further afield. Dogs are not allowed. U3A is aimed at people who are no longer in full time employment, or work part-time, retired or semi-retired. There are 13 walking groups under the U3A umbrella (Jan 18): Stroll to Lunch, Hike to Lunch, Walk to Lunch 1, 2 and 3, Dales, Hill and Dale, Wayfarers, Fell, Walk to Tea, Walks at the Weekend, Ten to Tea, Further and Faster. One group walks at weekends. Meeting point: Different meeting points depending on the group and the walk. Cost: Annual membership of Ilkley U3A is £13.50 from 1 Aug - 31 July. Car sharing costs on the day. Wayfarers: £1 for recce costs by leader. Fell walkers group 12/16 miles. ​Cost: Free. No booking required. Type: Local walks of up to 5 miles (Sunday) and 3 / 4 miles (Friday) exploring lesser known paths and usually including a refreshment stop. Sunday walks finish by 1pm, Friday walks by 12.00. When: Mid-week (normally Tuesday) and weekends throughout year. Meeting point: Car park in Otley when cars are being used. Cost: £5 per year (newcomers can try before paying). Car sharing contribution when used. Type: Walks vary from 5 /12 miles, often 7 / 8, easy to hard. A long distance walk is usually tackled in day sections in the summer using public transport. Dogs are not allowed. When: 3 groups meet on Tuesdays (A+ variable times, A at 9.30 and C at 10.00). B group meets on Thursdays. Meeting point: All groups meet at the Old Bridge, Ilkley (south side) for car sharing. Cost: Annual membership fee for Ramblers is currently £30 pa or £44 joint. Car sharing costs on the day. Type: A+ walk 12 miles or over, moderate or strenuous. A walk 10/13 miles, moderate or strenuous. B walk 8/10 miles, moderate. C walk 5/7 miles, leisurely or moderate. There are 8 walking groups run by HRC, based on walk grade (A – E). When: Sundays (2 or 3 groups) and Wednesdays (4 or 5 groups). Where: All groups meet half way along Park Road to the SW of Trinity Church, Harrogate. Cost: Annual membership of HRC is £13 single, £18 double (includes one off £3 joining fee). Newcomers can try before paying. When: Midweek and weekends throughout the year. 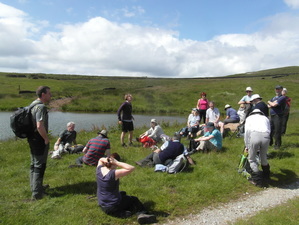 Where: Groups meet throughout Bradford District depending on where the walk starts. Type: Walks vary between 3 and 8 miles. When: Monday to Thursday throughout the year. Type: Walks start at 10.30 and finish between 2.30 and 3.00. Dogs are not allowed.